Tart and refreshing, grapefruit can act as a stand-alone snack or as an ingredient to your favorite salad or cocktail. Packed with fiber and enough vitamin C to meet more than 50% of a person’s daily need, it’s no surprise that grapefruit is a hit amongst health enthusiasts everywhere. 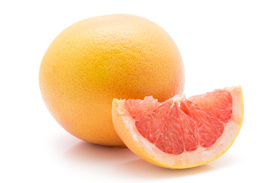 With a reddish rind and a deep-red internal color, Star Ruby grapefruit are delicious and beautiful! Less acidic that other grapefruit varieties, Red Rubies have little to no seeds and make a great addition to any healthy diet! With few to no seeds and delightful flavor, it’s no surprise that Melo Golds are a hit while in season! 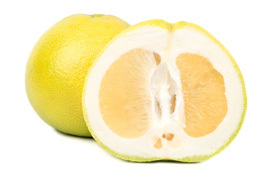 Its white flesh and juicy components are a great addition to parfaits, fruit salads, smoothies and more! The largest of all grapefruit varieties, Pommelos are sweet, tangy and can often be used as an ingredient for salads or marmalades. 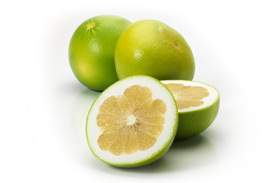 Known for its pink flesh and green rind, pommelos are a seasonal favorite amongst many!